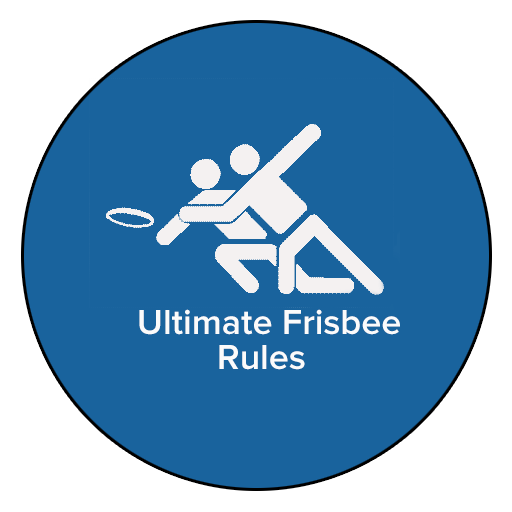 Simple Ultimate Frisbee rules for beginners. Even if you've never played before, you can get a game going in no time! It's a super fun, fast-paced football-type game that uses a disc instead of a football. To really enjoy the game and be able to play it well, there are a couple of skills you need to learn. 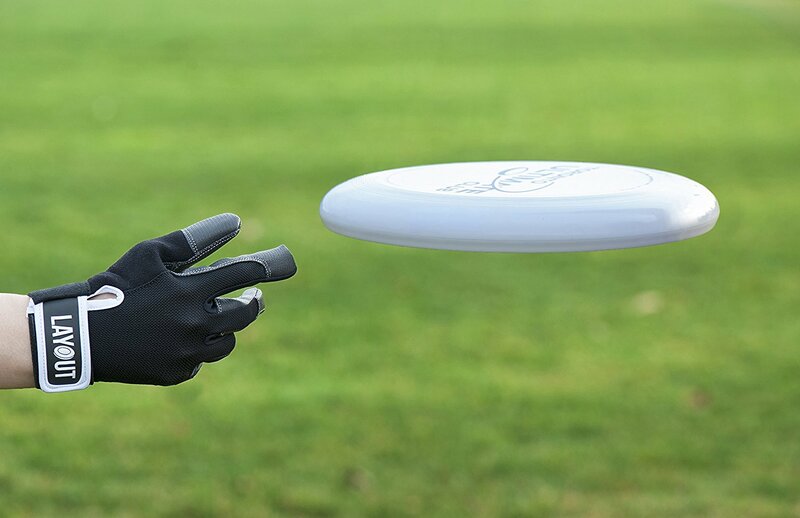 It may sound obvious, but before you can really enjoy the fast-paced action, you've got to know how to throw a frisbee and how to catch one. If you've never done it before, it can be a bit frustrating at first but once you get the hang of it, you'll be able to catch and throw on the move. 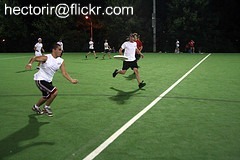 The object of the game is to move the frisbee disc down the field to score more goals than your opponent. A regulation field is a rectangle measuring 70 yards by 40 yards with 2 end zones that are 25 yards deep. A sport disc (or Frisbee as they are commonly called) is all you really need. They come in all colors and designs, and you can even get them custom-made or personalized. For those who become more serious about the game, gloves are helpful for protection and better grip. 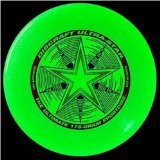 Teaching a group how to play ultimate frisbee? Here's an equipment pack perfect for instructing all ages. 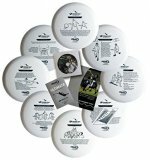 Each pack includes discs, official ultimate frisbee rules, curriculum, and skills & drills handbooks. The Outreach Kit has the instructions for each of the necessary skills printed on the discs for easy reference. A regulation game has 2 teams with 7 players on each team. To start the game, both teams line up in their respective end zones, and the defensive team throws the frisbee to the other end like a "kick-off" in football. This throw is known as a "pull." A coin toss (or a flip of the disc) is used to determine who will receive the disc first. The players on the throwing team can move anywhere in their end zone, but they may not cross the goal line until the disc is thrown. The players on the receiving team must stand with one foot on their goal line. As soon as the disc is released, all players are free to move wherever they want. No player on the team throwing off is allowed to touch the disc before a member of the receiving team has touched it. 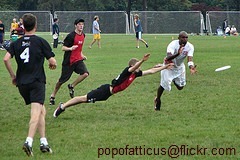 The objective of the pull is to send the frisbee as far down the field as possible to give the offensive team poor field position. 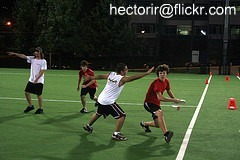 The disc can be moved around the field in any direction by passing it to a teammate. After catching a pass, the receiver must come to a stop as quickly as possible and then can only move by pivoting off of an established pivot foot. A player may throw the disc before coming to a complete stop and establishing a pivot foot, but it must be thrown before the third step after catching the disc. If the disc is caught by an offensive and defensive player at the same time, the disc goes to the offense. Once a player catches the disc, she only has 10 seconds to pass it. This period is called the "stall." Each second is counted out loud by a defender (called a "marker") who must be standing within 10 feet of the thrower. A player may hold the disc for longer than 10 seconds if no marker is within 10 feet or if the marker isn't counting out loud. If a new marker comes, the new defender has to restart the stall count from zero. Only one defender may guard the thrower at a time, and there must be at least a disc's diameter distance between the marker and the thrower. The marker can't restrict the thrower from pivoting. When a player jumps from inbounds to catch a disc that has passed out-of-bounds the disc must be thrown back inbounds before the player's feet or any other part of her body touches the ground. The thrower may only catch her own throw if another player touches it in the air first. When play stops, the player who was in possession keeps the disc. All players on the field must come to a stop as quickly as possible until play resumes. The marker restarts play by touching the disc in her opponent's hands. If the thrower passes the disc before the marker touches it, the pass doesn't count, and it's replayed. A point is scored when a player catches the disc in the end zone his team is attacking. If a defender intercepts the pass in the end zone they are defending, they get a point. A player cannot score by running into the end zone with the disc. After a point is scored, the teams exchange ends. The team that just scored remains in the end zone while their opponent lines up in the opposite end zone. Play resumes with a pull by the scoring team. Games are often played to 21, but they don't have to be. However, the winning team must be ahead by 2 goals. If the score is tied at 20-20, the game goes into overtime and play continues until one team gains a 2-point lead or one team reaches 25. An incomplete pass results in a change of possession. When this happens, the defense immediately gets control of the disc wherever it landed. If it remains inbounds, they pick it up at that spot. If it went out-of-bounds, they take it from the place where it went out of play. Play doesn't stop when there's a turnover; it continues. Throw-away – the thrower makes a bad pass, and the disc lands on the ground. Drop – the receiver fails to catch the disc. Block – a defender makes contact with the disc while it's in the air and knocks it to the ground. Interception – a defender catches a pass thrown by the offensive team. Out of bounds – the disc lands out of bounds or is caught by a player who is out of bounds or leaps from out of bounds. Stall – the player holding the disc doesn’t throw it before the marker has counted 10 seconds. 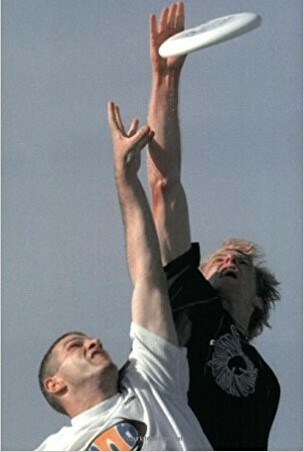 Hand-off – players can’t hand the disc off to one another. A player may not catch his own throw until it is touched by another player. Each overtime period lasts for 5 minutes. Fouls – Contact between opposing players that disrupts possession of the disc. (Incidental contact is not a foul.) Play immediately resumes as if the possession were retained. If the player called for the foul disagrees with the call, the disc goes back to the last thrower and play resumes. No physical contact is allowed. Violations – Any play that breaks the rules and doesn’t involve physical contact. Violations include traveling with the disc, double teaming, and picking (obstructing the movement of a defensive player.) Also, defensive players may not strip the disc from an offensive player. A half-time break takes place when one team reaches the half-way marker in the score. If teams are playing up to an odd number, the number for half-time is rounded up. For example, if the game is being played to 21, half-time would occur after the first team scores 11 points. Half-time lasts for 10 minutes. Teams may substitute players after a point is scored or if a player is injured. Typically, there are no officials. Players are responsible for playing fair, calling their own fouls, and making their own out-of-bounds calls. 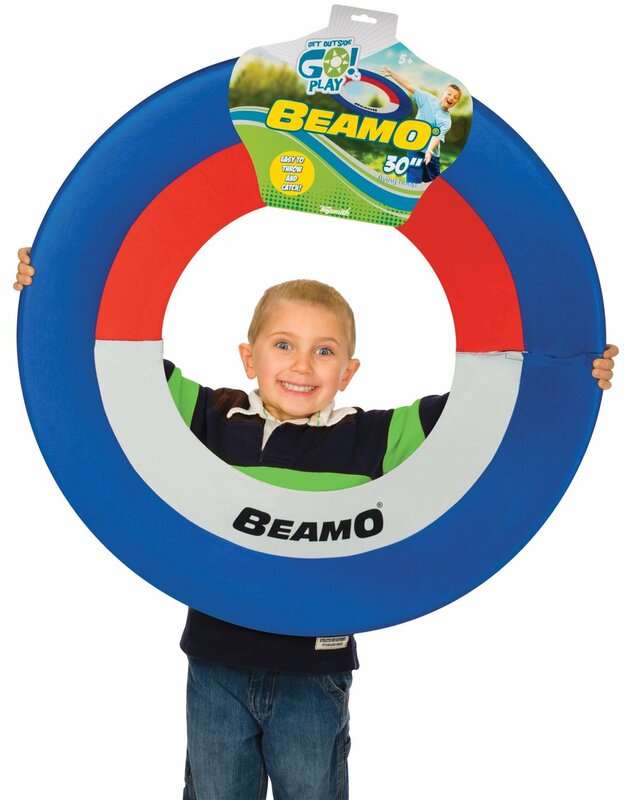 Use a soft nerf-type frisbee or a giant flying disc. Use some type of ball instead of a frisbee. If you use a ball that bounces, allow 1 bounce before the receiver has to catch it. Play with few or more players on each team. Don't let anyone defend the thrower. Allow the player with the disc to throw freely. Play shorter games to fewer points. Play for a certain period of time, and see who has the most points when time expires. Do away with the 10-second counting rule or decrease the time to speed the game up. 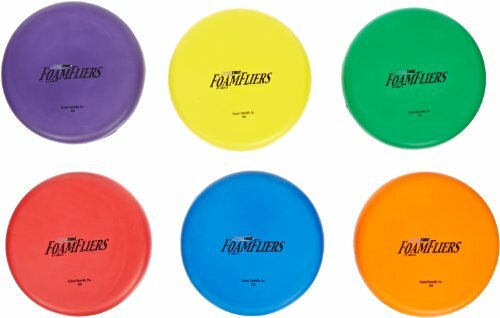 These are just a few ways to tweak the Ultimate Frisbee rules to fit your needs. Maybe they'll give you some ideas for adapting the game to make it more fun for your group. Check out USA Ultimate for news, events, official ultimate frisbee rules, and more.